I hadn't planned on posting today, but after seeing the post yesterday from Becky at Once Upon a Time and the YA Highway post today about Unedited Bookshelves, I had to -- just a quick one. This only scratches the surface. I own more books than I can hope to read in this fleeting lifetime. I am a complete cheapskate. If you looked through my house, you'd be convinced I didn't read much (I have maybe twenty books, and a lot of those are textbooks I use for reference in tutoring). But I go to the library at least once a week to pick up new titles, and I read the 'oldies' on ProjectGutenberg. I don't have space or money for that many books, as much as I'd love to have a library! And for this reason, I have to be selective about what I read--there's simply not enough time to read it ALL. Alas. Susan, your comment struck a chord with me. It's only in the last couple of years that I've reached a point where I can actually stop reading a book if it hasn't grabbed me. Up to that point, I ALWAYS finished a book, even if I hated it. A commitment thing, I think. But I feel a great sense of freedom since I started "quitting" on books. I thought about your comment all weekend -- and I feel even more free. Since I started writing YA, I've felt like I should read this or I should read that... and you know what? I *don't* have to! I am fairly selective about the books I read, but now I think I am going to take that one step further. Wow! 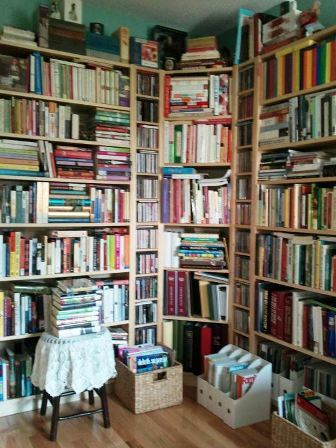 I have a lot of books too, but you may have me beat. Love this-it looks my my crazy bookshelves:) Thanks for the follow. It's nice to meet you! Crazy bookshelves are good! Nice to meet you as well! I did the same post, tyresecoleman.blogspot.com. Going over immediately to check it out!